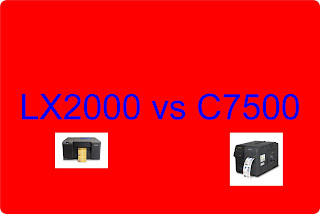 Recently, I’ve been asked, “What are the differences between the C7500 and the LX2000?” Frankly, this question is coming from people who do not want to spend the $8500 or more on the C7500; but want good print quality. The LX2000 is a lot less expensive and can print up to 8" wide labels. 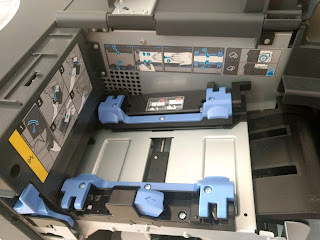 In this post, I’ll explain my view of the 10 biggest differences between these two color label printers. so can the C7500. Top is C7500 and bottom is LX2000; both are at the standard settings. See how the blue in the top of the picture (C7500) is darker, richer. The ink cost in the LX2000 is much higher; but not as much as I expected for this artwork at normal settings. 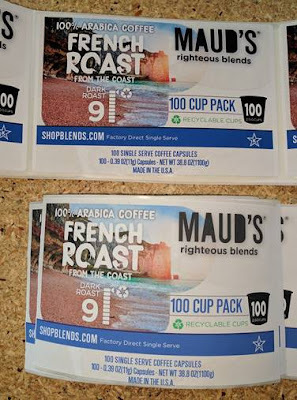 Using this label artwork, the LX2000 ink cost is estimated at $0.069/label versus $0.049/label for the C7500. $0.02/label more. These estimates are at normal settings. To get a higher print quality, many companies would be forced to run the LX2000 at a higher print quality setting. Therefore, I believe in reality the ink cost difference would be much higher. 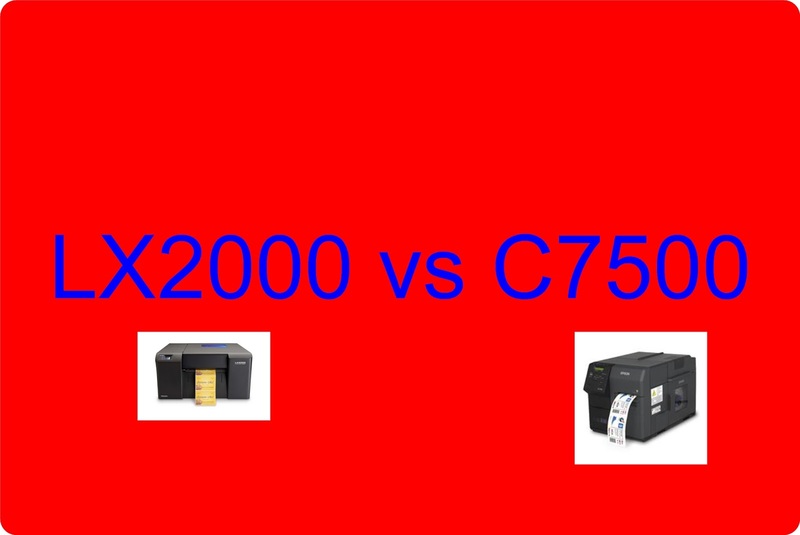 The LX2000 ink cartridge is much smaller than the C7500. Therefore, yields are much lower. 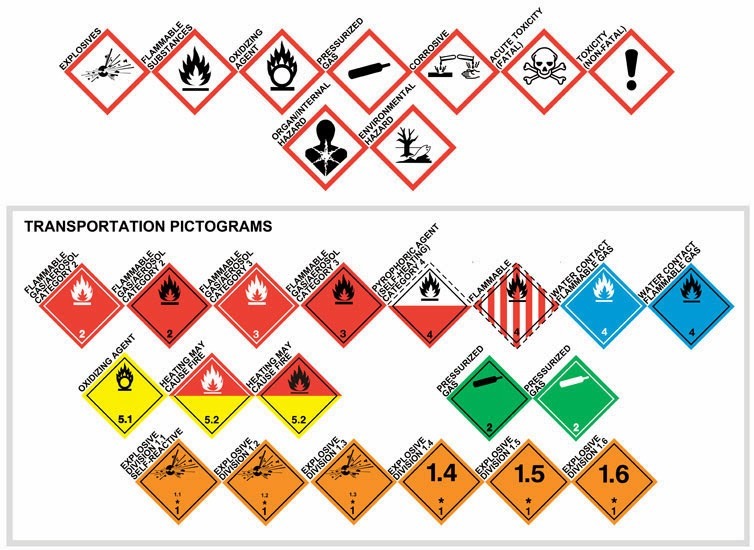 In the above example, you would get 1094 labels/LX2000 Cyan cartridge and 9,085/C7500 cartridge. Almost 9X more. Magenta and yellow are about the same difference. Black is only 2X as the black cartridge is larger in the LX2000. The LX2000 uses consumable printheads. 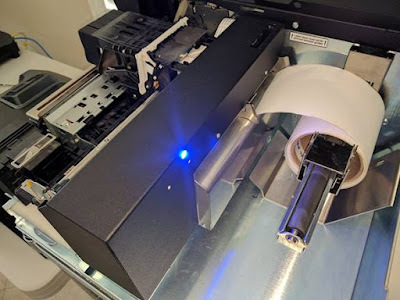 You’ll need to spend $250+ for a printhead occasionally when printing large volumes. The LX2000 is very slow compared to the C7500. Watch how long it takes to print one label. 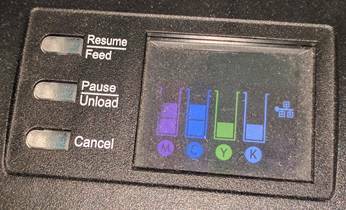 In the video, the printer just finished cutting one label. Overall it took about 5 minutes to print 10 labels for the ink calculation at the normal setting. At the high print quality setting, the speed would be much slower. Relatively, the C7500 prints much faster than the LX2000. The C7500 offers a built in rewinder; the LX2000 does not. Watch the C7500 print and rewind 100 4” x 6” labels in 1 minute. The LX2000 uses a series of button pushes that I still don’t understand. I believe you can get 20+ different actions based on these three buttons. The LX2000 is a HP printhead inside of a metal box. I find the design finicky. In fact, I cut my finger printing the 10 labels required for the ink calculation. The inside of the C7500 is well designed; especially the media path which prevents side-to-side movement of the label media. Label Roll: the LX2000 has a max OD of 6”. The C7500 has a max OD of 8”. Larger rolls mean fewer changes and lower label costs. FULL DISCLOSURE: I find Primera difficult to work with. 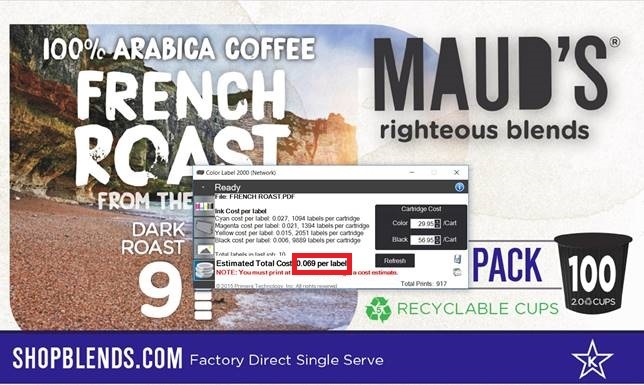 For sure, Primera does not want resellers like us as partners as they prefer to sell direct to consumers. For our customers, we’ll provide technical support; and we’ll help you negotiate the repair processes of our vendors. We work hard for our customers. I hope these 10 aspects explain our view of the differences between the C7500 and the LX2000. I understand hardware cost is important; but you sometimes get more value by investing a bit more money. If you have questions comparing label printers, call us. We’ll be happy to gain an understanding of your requirements and recommend the best label printing solution for your organization. Hi Guy, what software are you using to calculate ink cost? Does this come with the printer? Simon, thanks for asking. For the LX2000, the ink calculator is built into the driver. You just need to print at least 10 copies. 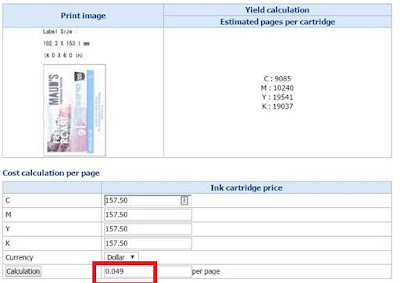 For the printers, resellers have access to an ink calculator to estimate ink yield/cost. Thank you for sharing the information…..Please check it Now….